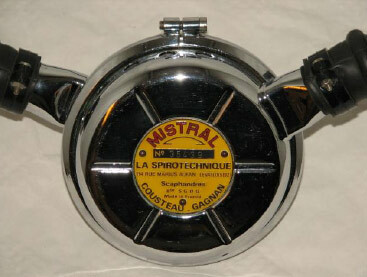 La Spirotechnique was formed in 1946 as the SCUBA division of L’ Aire Liquide and would produce the early models of the CG45 regulators and continue through the 1970’s to produce the Mistral and Royal Mistral regulators in various forms. 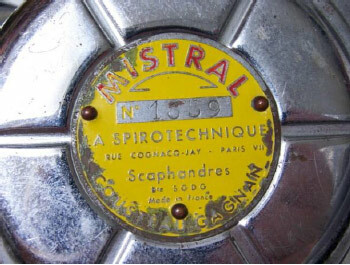 The Mistral regulators made by La Spirotechnique in France were the most successful line of two hose regulators in Europe. The single stage design was also licensed to US Divers for the United States market and Siebe Gorman in the UK. 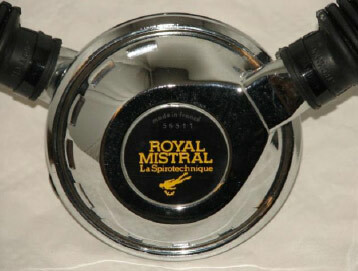 Starting in 1955 and continuing through the 80’s the Mistral and Royal Mistral were used by divers around the world. The first version of the Mistral featured an all chrome body and yoke with a yellow riveted main can label. There are three different addresses used on these versions that correspond to manufacturing locations. Internally it has the standard single stage two lever design. Because the mechanism was very simple but extremely rugged and reliable Cousteau chose this regulator as the primary and most often seen regulator during the voyages of the Calypso. One of the challenges faced by divers in the US who want to use the French made Mistrals is the diameter of the nozzle where it contacts the O-ring on the cylinder valve. The French Mistrals are all metric sized and the nozzle is just a bit too large in diameter to seal against the O-ring on US cylinder valves. If you or a friend are handy with a lathe you can turn the nozzle down slightly and you are good to do. I understand that there were regulators made for the US market with nozzles that fit American cylinders without any modification. But without measuring or putting it on a cylinder it is difficult to determine which nozzle a particular regulator may have. Most Mistrals will be found with hoses that are 1” on both ends and a simple metal T mouthpiece without one-way valves. Many mouthpieces were changed when newer versions that had valves became available. Hose clamps were nylon with a screw and nut or single use metal strap style. 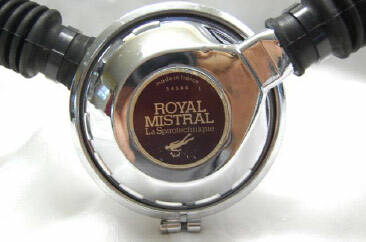 In 1962 LaSpirotechnique introduced the Royal Mistral which internally is the same as the earlier version but had a styling change to the top and bottom cans. A crown label was first used with later versions having a more simple design. Most have a high pressure port on the side of the top can housing. A tube was soldered to the body of the regulator and curved around to a port on the side. Three different size ports were used. Some ports will work with adaptors for US gauges while others are almost too complicated to use. Although a great idea, in my opinion a banjo fitting is still a safer and more reliable way to go. The Royal Mistral had hoses that remained 1” on the ends but much larger in the middle. These hoses are very flexible and comfortable to use when new but being made from a neoprene compound they will deteriorate and become stiff if not properly cared for. A new mouthpiece design was introduced that contained one way valves and elbows that could rotate up or down for comfort. Hoses clamps varied from nylon with screws, single use metal strap type, and nylon zip tie style. Although there were a few main can label changes throughout the years, the internals always remained the same. 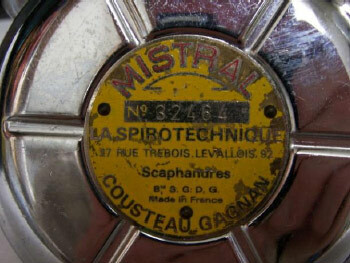 The Mistral was the preferred regulator of Cousteau and the Cousteau team of the Calypso. 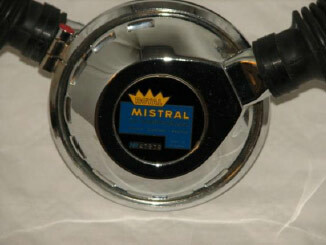 The first version of the Mistral was the regulator used in the famous yellow hydromatic housings seen in Cousteau’s movies, books and TV shows. Most photographs seen of Captain Cousteau in scuba gear are of him using a Mistral or Royal Mistral.